This year I managed to sign up for the full Spring Trail Series hosted by Dark and White Events. This is three 15k-ish up and down the hills in the Peak District during the spring. I’ve run a couple of their events before, and was really looking forward do this. Last year, I ran the last event in the series at Low Bradfield and came well into the “Gold” pace bracket, setting me up for what I hoped would be similar performances in this full series. Sadly, that wasn’t to be! My starting group left at 8:50, and straightaway we were on a tough little hill on slightly uneven cobbles and muddy, gravelly sections. Eventually, we came to a gate with an arrow on it, pointing 10-11ish o’clock. Going through the gate, there was a hole in the wall on the left, with a footpath sign post on it. The group we were in about 10 or so runners, seemed dubious, but the super fast people in our group had already speed off across the field through this gap in the wall and were off in the distance. We checked the sign again and then followed, crossing the field, into a second. My spider senses were definitely tingling at this point and as we came to the other side of that second field, next to a small barn I gave in and checked the route map we’ve been given. Straight away I knew what was wrong: The first section of the route was pretty much due north and we’d swung away to the west. It was so clear when looking at map it was hard not to get really frustrated at such a rookie error. I stopped the runners around me, showed them the map and we all turned around and headed back. The 2-3 ahead of us were way out of earshot by now, so we just left them to it and retraced our footsteps and got back on track. Later on we heard that the organisers had discovered the issue and paused the starts while they fixed the sign. 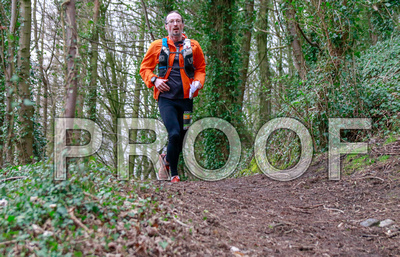 A zombified me on halfway up the first climb to the feedstation by Chris Meads Photography. Getting back on track, I knew that I’d pretty much stuff my chances for a gold time, but pushed on regardless. We were still climbing the hill at this point, but eventually we topped it, allowing me to try my best to regain some time. A nice downhill till we met the Monsal trail and turn right onto it, heading east and swinging back to the south. Lovely and flat I did my best to claw back minutes before we swung north and started the first proper tough climb. It was about a k long, with a momentum sapping switch back into some woods. The checkpoint/feedstation was right at the top and ran out of oomph 10 metres before it. I didn’t stop long, just long enough to check in and grab a bit of trek bar before pushing on, out of the woods and onto the top of some rolling hills. From here, barring a short little hill, it was just over a k of glorious downhill. Although the ground was wet, the grip was good, and the path was gently curving and meaning I could hold a good pace. Eventually there was a tight switchback where I had to stop and slow down a chunk as a there was a horserider and a couple of walkers with it. All momentum gone! At this point, I started to realise how tired I was feeling just as some rain and wind started to pick up…. Next a gate and then onto the start of the final tough climb of the race. It was a fierce little hill, complete with really slippery mud and grass pretty much stopping me on my tracks. Speed-stomping up the hill rather than I running I over took someone, topped out and then rain for a far stile and a track through from woods. Soon this turned into the long awaited long downhill towards the finish. It was about 2k of fast downhill with a little flat section in the middle. I could really let the hill take me for some of it, but there were a couple of extremely muddy/slippery section which I didn’t have the balls to keep the pace up for. Hitting the flat for the last 2ish k, I managed to keep the momentum up until we started crossing a new field. The pounding downhill had taken far too much out of my legs and I really struggled to stay upright in the mud. I was swiftly overtaken my someone who’d been following behind me for the last couple of k, keeping my orange jacket just in sight. From here I was toast, really just hanging on as best I could until we joined the far end of the Monsal trail, until we almost reached where we’d left it earlier. I’d got a bit confused though by this point, this whole section feeling really familiar and I got really paranoid that I’d accidentally picked up the outgoing section again. Still, I stuck with it, the feeling never quite being enough to stop me and I finally realised I was in the right place when the path opened out into the field at the finish. I really wanted to find the final kick I normally have to try and run down the few runners ahead of me but I was completely spent and cruised over the line instead. Checking my watch I think realised that the mistake right at the start had added 1.3km to the overall distance, and most of those extra k run at a more gentle “I’m not sure this is right” pace. Oops. Final time, 1:27:02. The gold cut off was 1:15. Even with the extra 1.3km I’m not sure I’d have snuck in. I’m not sure if that’s fitness, or the softness of some of the course. Hopefully the next race will get me going a bit quicker! I’ve definitely learned a lesson here though. After discovering we’d gone wrong, I ran most of the rest of the route with the map folded in my hand to check. It was so easy to do and I don’t feel impacted the run at all. If I’d have done that from the start, I’d have never gone wrong!